Radiohead front man Thom Yorke teamed up with the 350 Earth climate campaign this weekend to create a massive human sculpture to raise awareness of climate change. More than 2,000 people braved the wind and rain to form an image of King Canute designed by the singer. The public art display was designed to send a climate warning to political leaders in the run-up to the UN Climate Talks in Cancun. According to legend, King Canute set his throne by the sea shore and commanded the tide to halt, only to be soaked by the ocean’s waves. Just as Canute realized his own hubris, world leaders today must realize the dangers of ignoring climate change and rise to solving the challenge. 350.org is named after 350 parts per million, what scientists say is the safe upper limit of carbon dioxide in the atmosphere. NASA calculates the current level of CO2 at more than 390 ppm. 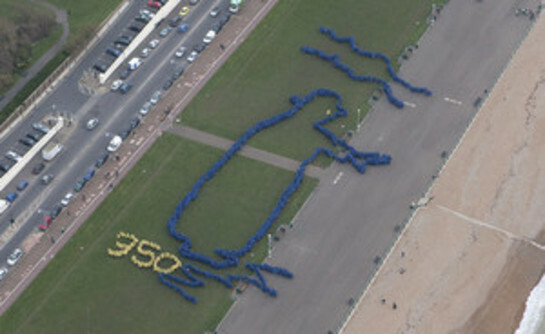 The image formed on the beaches of Brighton-Hove was designed by Yorke and his long-time collaborator Stanley Donwood. The picture also appeared on the cover of Yorke’s album Eraser. Yorke helped promote the event on Radiohead’s website and four million person strong Facebook page. The Brighton-Hove event had the backing of Brighton & Hove Council, who spearhead a city-wide coalition of organisations and businesses that form 10:10 Brighton & Hove. All have pledged to reduce CO2 emissions by 10% in a year by simple, achievable measures, in a bid to minimise the effects of climate change.